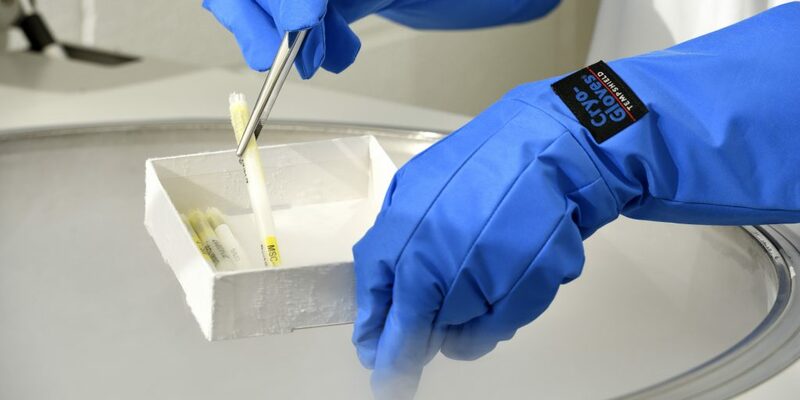 We offer both cryopreservation and cryorecovery services for rats, mice and cell lines. We can cryopreserve fertilized embryos from rats and mice, and cryopreserve sperm from mice. We can revive mice from frozen sperm or embryo archives from worldwide resources. Cryopreservation of sperm is available for mice, we require that you provide 2-4 adult males (15-24 weeks old) that are proven breeders. Service includes one freezing session and cryo storage for 3 years. After the initial 3-year period a storage fee would apply if you would like to continue storing samples with TGEF. Cryorecovery from sperm is performed via IVF with wild type eggs, and embryo transfer into pseudopregnant recipients. This service is currently only available for mice. Service fees for one session of cryorecovery includes both IVF and embryo transfer charges. We will provide you with the resultant offspring and you’re responsible for screening and genotyping litters, unless you request additional services from TGEF. Because of the cost for egg donor animals and labor, every cryorecovery attempt is counted as a session. If there are no offspring produced because of sperm quality, service fee will be charged as follows: if there were no fertilized eggs after IVF, only the cost of IVF will be charged; if there were fertilized eggs and embryo transfer surgeries were performed, the full service fee will be charged. Cryopreservation of fertilized embryos requires the user to provide plugged females that have been superovulated and mated. The investigator is responsible for superovulation and mating of female embryo donors. TGEF can assist you with required protocols for superovulation and mating, and provide hormones at no extra cost. Service charge includes 1 session of embryo freezing from at least 3 donor females. Typically we’d like to freeze down at least 100 fertilized embryos per session. Service fee includes liquid nitrogen storage for 3 years. After the initial 3-year period a storage fee would apply if you would like to continue storing samples with TGEF. The storage fee will be calculated based on the number of samples stored with us and the real cost for liquid nitrogen from the previous year. This service is currently available for both rats and mice. Cryorecovery from fertilized embryos requires an embryo transfer of frozen embryos into pseudopregnant recipients. Service fee for one session includes up to 4 embryo transfer surgeries. For all Cryorecovery services, we will provide you with the resultant offspring and you’re responsible for screening and genotyping litters, unless you request additional services from TGEF. Expansion and freezing of ES cells or other cell lines is also available. We freeze a minimum of 5 vials per line or clone, liquid nitrogen storage for 3 years is included in the service fee. After the initial 3 year period a storage fee would apply if you would like to continue storing samples with TGEF. The storage fee will be calculated based on the number of samples stored with us and the real cost for liquid nitrogen from the previous year. We offer rental of a liquid nitrogen dry shipper if you require frozen samples to be shipped by your laboratory. Please use the liquid nitrogen dry shipper to import any frozen sperm or embryo samples, and handle them with care.